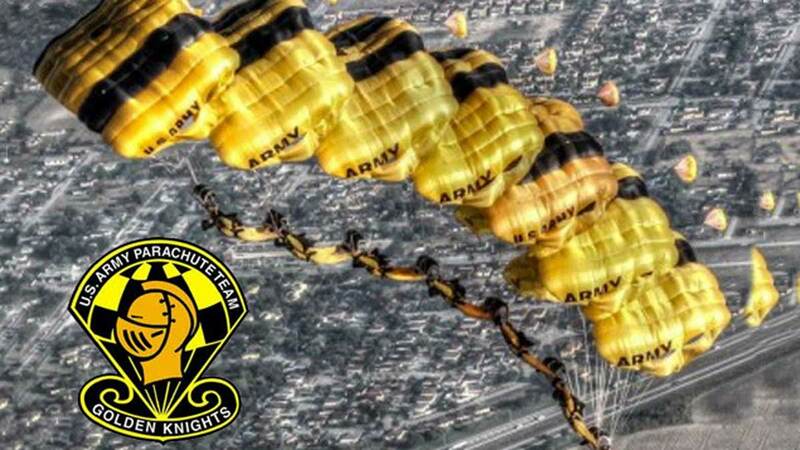 The United States Army Parachute Team, nicknamed “The Golden Knights,” is the U.S. Army’s official aerial demonstration team. The Team travels around the United States, performing parachute demonstrations at air shows, major league football and baseball games, and special events, connecting the Army with the American people. Over the past 50 years, the Team has grown to more than 90 people, including jumpers, pilots, administrators, parachute technicians, and media relations and supply specialists. The demonstration teams perform more than 100 demonstrations a year with the help of the Team’s four dedicated aircraft. The Tandem section takes Soldiers and VIPs on tandem skydives, and the Competition section continues to win at several national and international competitions per year. The Team represents the finest of Soldiers and personifies the Army Values, showing the world the professionalism, precision, and discipline of today’s modern Army. Under a canopy of black and gold I fly the colors of the Army. I volunteered to become an ambassador of my service and I will always endeavor to uphold the prestige, honor, high standards, and esprit de corps of the United States Army Parachute Team. The memories, achievements, and legacy of all my predecessors are my responsibility; I will not fail them. Safety is my way of life. Nothing is worth its compromise. No jump is so important, no flight is so essential, and no activity that pressing. All shall look to me for the standard. Always will I keep myself mentally alert, substance-free, physically fit, and morally straight. I represent the image of the U. S. Army. I cannot lose the confidence entrusted in me as a Golden Knight and I will not tolerate those who do. Professionalism is my trademark regardless of the time or place. My pursuit of excellence in training and performance is with diligence, dedication and attention to detail. My own goals are second to those of the Team and the expectation of me to pass on my skills to all who desire. The goal I pursue is simple, yet bears a responsibility I must discharge without reservation: when I have gained the respect, admiration, and gratitude of the American public and my teammates, then I have fulfilled my mission as a Golden Knight.